Numerically there are 63 missions in the game. In reality this number gets far more confusing. There are four different plot stages in the game. Each plot stage changes the dialogue, character, statistics, and behavior of ALL of the alien races. Missions 11-25 are missing. Removed training missions that people complained dragged down the plot. Missions 26-35 are the class specific missions. There are actually 30 missions here, but depending on which class you picked you will only experience 10 of them. Starting with these missions and going to the end of the game, all of the missions are the same for all three professions. 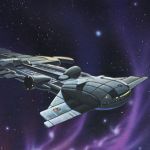 However many missions can be completed in multiple ways, either by negotiation, destroying alien vessels, or sometimes outright refusing to take a mission. For those of you who are testing these missions out, what does this mean? WARNING: Once you advance to a new plot stage, none of the hotkeys will return you to a previous plot stage. Using the F11/F12 Hot Keys changes the mission number on your info panel at the top left of your screen. The function keys will advance/reduce the missions whilst you are in hyperspace. Look closely at the numbers; this is where you determine which mission you are in. The screen will not change in any fashion as the mission numbers are manipulated up or down. Regarding the now-deleted missions, one of them was to 'gather up 50 Black Acid Squirters' from a planet and return them to the starport. Steve is correct, that particular quest did detract from the plot. There were quite a few "collect N lifeforms/minerals" type quests, but they were meant to help the player get out and begin exploring the galaxy. There were just too many. I think 10 is a good number. You pretty much have to do these initial quests to complete the game. I'm really eager to see it without all the debug keys. Hope we can get there soon. I can't go further in the game because I don't find "Thorium" at all. It's one of the first missions. I've seen, on this forum, that there is Thorium on "Oceanic" planet. I've been looking for it many hours on different oceanic planets but there isn't Thorium. The web is full of "game walkthrough". What's the problem about "revealing where is Thorium" here ? It could be useful for other gamers. And I have finally found "Thorium" (on an oceanic planet, as the mission briefing said, and ... elsewhere too !). I am currently looking for the whining orb. I have found the planet it is on, but not the coordinates on the planet. Are there any aliens who could point me in the right direction?